I managed to get exactly none of this done and actually did very little in August at all on the savings and investment front. Why did I get so little done? Frankly work was so busy for me during the month that I spent the whole month just trying to get enough sleep and not burn myself out. I get the benefit of having the earnings taxed in my wife's name going forward. It's a no brainer and I'm just putting things into place so I don't get burned too badly from market moves while I buy and sell in different accounts. August was the first month where I got to a net worth of $800,000! My net worth is up pretty significantly this month however other than saving a decent amount into our home loan offset account I didn't actually do all that much which is a little disappointing. Get my individual stock holdings down to 10 individual stocks (currently at 11). I could keep going however these are just a few of the larger things I need to do to get my portfolio into shape over time. Some of these I just need to sit down a do a bit of work and others I can only do opportunistically. However that's enough about the future plan...let's see how I've actually performed this month. This post is one I really enjoy writing every year. I love looking back on the year and assessing how I did and also looking at what I wanted to achieve. In some ways the last year has been a little boring on the financial front. I have been building cash so that my wife and I can look at buying our new home so I haven't been as active with my investments as I was in the first few years of this blog. However this year I have been doing a lot on the personal front and in cleaning up my share portfolio which had grown incredibly unfocused. However even allowing for this we still managed to do very well over the year. Before I go into the details of what we did over the year it may be worth looking at how I have done since I started writing this blog over 5 years ago. I thought I would start this post with a quick thank you to those who still read this blog 5 years after it first started. I know that I am posting less than I used to and it has gone from being a blog which disseminated some (hopefully) useful financial knowledge to pretty much a pure personal financial blog. I know I've explained it before but I thought it would be worth recapping why I decided to post less. Most of us only have a finite amount of time in the day and I had to decide how to spend mine. Instead of posting on this blog (and indeed on other blogs which I write) I decided to scale that back and spend time actually investing and trying to get ahead financially. There were plenty of things which I had planned to do financially which, frankly, were never getting done and I was spending hours each week writing blog posts. I decided that a better use of my time was to focus on my business of investing. Unfortunately this has meant that I have far less time to post here. With that being said I do still enjoy tracking my financial progress and it does allow me to take stock once a month of where I am at. This month I will also do an annual review of how I have performed over the last year (I will upload that post in a few days time). I don't think I'm the only one that had a tough month this month with markets going into a nose dive on the back of the unexpected Brexit vote. My share investments tend to be higher risk and have a higher beta and my financial performance suffered significantly as a result. I continue to honestly be surprised at how my net worth continues to rise month on month. My wife and I have been talking about finances a lot this month. As crazy as it sounds this is the first time in my life I have felt any anxiety about money at all. Do I sell some investment assets to be able to afford a better home? Do I compromise on where I live to buy something more affordable? Do I buy something more expensive and keep the investment assets but leverage myself more? Do we go for the area we want but perhaps not the house that we want? Can I afford to take extra leverage if I'm the sole bread winner and we have kids? Obviously in a world with limited resources where I am not a multi-millionaire these are all very real questions and questions that lots of people ask...it's just my time to ask and go through these issues. Why do I raise all of these issues in a post about my net worth? 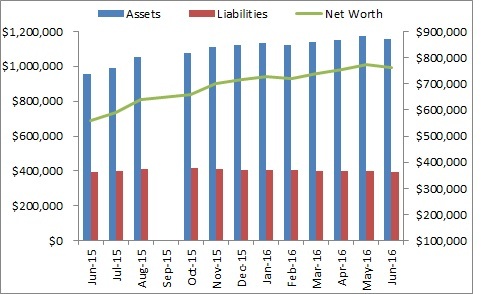 I haven't been tracking my net worth performance this month all that closely and given the stress I have been feeling with the above questions it was a relief and pleasant surprise to see things continue to go well. So how did I actually do this month? I was surprised how well I performed this month. I actually spent a fair amount of time this month working on our personal finances and sorting out some admin problems we had (including spending about 2 hours speaking to my superannuation fund to make sure that there weren't any admin errors). This month we focused a lot on trading and not a lot on investing. I'm hoping to get back into investing more aggressively over the next few months. This month was a pretty good month...I managed to get away for a 2 week break overseas and also to do pretty well in terms of my net worth performance. Instead of a long rambling summary I thought I would get straight into the numbers. 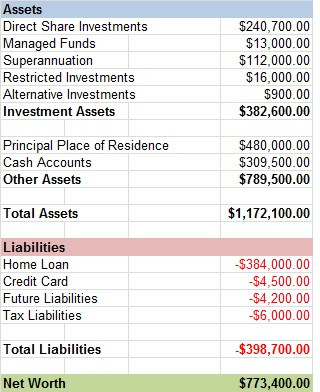 Below I have included a detailed breakdown of my net worth performance. In line with the new way I disclose my net worth and the extra detail provided I thought I would address each of the major categories in turn. I didn't invest anything new in the share market this month and the total gain was due to positive share market moves. Given the real pain I have taken over the last few months this was a welcome relief. This was my first negative month in 7 months which is a pretty good run rate when you think about it but I have a bit of an embarrassing fact to admit...I totally screwed up last month's net worth which actually did terribly...as in the worst performance I have ever had. Why did I outline this? Because I actually did reasonably well this month in increasing my net worth to $720,100 and my explanations wouldn't have made sense in the context of a falling net worth. You may have noticed that over the last few months I have really dropped off on my posting schedule. I have not uploaded any goals for this year and I haven't really been updating you on what has been going on in my financial life. Originally this is because I was developing a new financial blog concept. This blog was originally set up when I wanted to be rich and take over the world. Since I started this blog however many things in my life have changed including my perspective on life. I sat down and did some really hard thinking and worked out that...you know what? I don't know what I would do with $90 million that I couldn't do with $5 million and what I want with the $5 million is more freedom rather than toys. The only extravagance I would spring for is Business class airline seating (seriously!). If I'm going to be honest with you I don't really know what I want anymore. I'm in this odd place where I'm remarkably comfortable but I'm not really sure what comes next. I'm not financially "free" yet and I'm going to keep working towards this goal but I haven't yet nailed down what a 'perfect' life would look like and until I do my goals are in a little bit of limbo. With that out of the way - I will (for the foreseeable future) still be updating my net worth on this blog. When I work out what I want to do next you will be the first to know. Another month and another year have gone by and I'm incredibly happy with house this month and this year have panned out. Not everything has gone to plan especially in relation to this I couldn't control (like the stock market) however having a plan in place for my own personal finances helped me whether some pretty tough conditions to come out far ahead of where I originally thought I would be. Enough of the nostalgia and onto the numbers. Below I have provided the usual summary of my net worth however I have gone into far more detail than I usually do on my goal tracker given I have just completed my goals for the year. This month I had hoped to increase my net worth to $705,000 so I was pleasantly surprised to see it increase far more than that. Some of the increase was driven by large factors but a lot of it was just grinding along and following the plan I have laid down for myself.